As one of the first doctors to use Botox® for cosmetic applications in the early 1990s, Dr. Amiya Prasad believes in personal customization and conservative application that suits his natural-looking aesthetic style. As always, Dr. Prasad makes sure to clearly explain to all his patients the factors needed to be understood, before giving his expert recommendation to the patient’s current facial issue. He begins with scientific facts, which is comprised of genetics, health issues, and the huge influence of environmental factors. For patients, this type of approach sets them at ease, for what they perceive as their imperfections is seen by Dr. Prasad as their unique characteristic beauty that can be enhanced with a skilled and experienced touch. More often than not, patients assume that aggressive treatments like surgery are the way to maintain or regain their intrinsic youth and beauty. However, Dr. Prasad, when fully aware of the patient’s problem, will only recommend the most beneficial option—which may or may not include surgery. In the case of wrinkles on the facial area, Botox® is often the better or only option when compared to surgery. It was discovered centuries ago as part of a bacterium found in ham and sausage. It is a fact that this bacterium, which German scientist Van Emengem named Bacillusbotolinium (derived from the Latin word botolus meaning “sausage”) causes paralysis, extreme twitching, and even death, to name a few. Botolinum toxic type A, also known as Botox® Cosmetic, is a safer derivative of this bacterium, used to minimize wrinkles through the careful and exact paralysis of facial muscles. Botox cannot be a treatment for permanent wrinkles that are not prompted by constant muscular contractions, nor is a surgical procedure advisable to erase wrinkles that are caused by normal facial reactions. Botox® is also most frequently injected in the glabullar area of one’s face, which in layman’s terms, refers to the muscles that control “frown lines”. 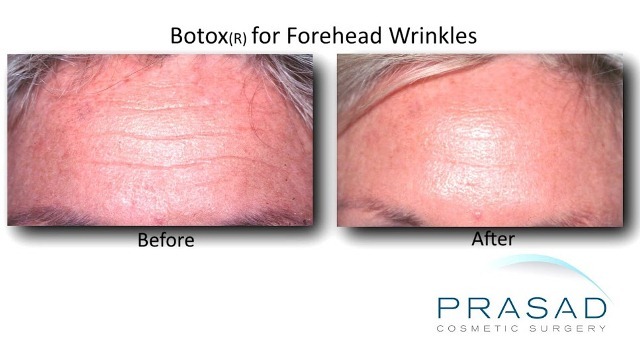 Botox is also injected into the muscles of the forehead to lessen crease formation and draw attention to the eyes. It has also been applied to breasts to control drooping or sagging. Botox® is also know to cure physical ailments such as migraines and spinal diseases. Through Dr. Amiya Prasad’s very conservative way of performing this non-surgical procedure, Botox® rejuvenates and reduces the visibility of wrinkles, fine lines, and creases around the eyes and face. Dr. Prasad’s steady hand, perception of individual beauty, and artistic style ensures that his patients do not have a petrified look, but rather, that they look like a fresher version of themselves. Dr. Prasad believes in simply improving, and not tampering with, a patient’s natural beauty and facial structure. Once Dr. Amiya Prasad decides that Botox® is ideal for one’s facial enhancement, given that the patient also agrees, the treatment can be done right away. The patient may also leave immediately after the treatment. As always, it is necessary to avoid lying down for four to six hours as the liquid sets into the muscles. Newbies to Botox® rejuvenation may expect some puffiness on the upper half of the face, but this gradually subsides within two to three days. Ironically, the puffiness may make one simply look a bit different, but not so much to fret or feel they don’t look like themselves. There have been side effects in patients noted down on other websites, such as eye-twitching, facial drooping, or asymmetry of the facial contour, which can occur within the first 24-48 hours and can be quickly remedied. 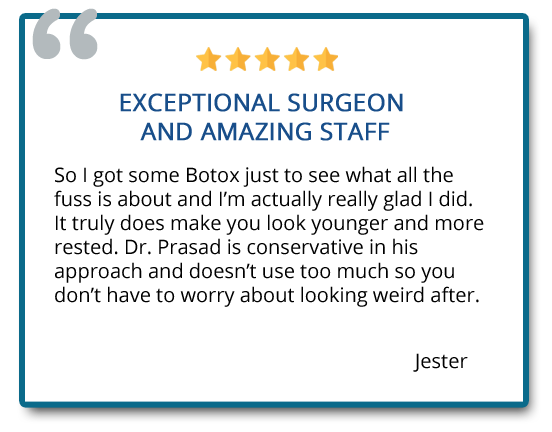 With Dr. Prasad’s steady hand and long-term successful use of Botox, he assures his patients that these side effects are kept to a minimum. 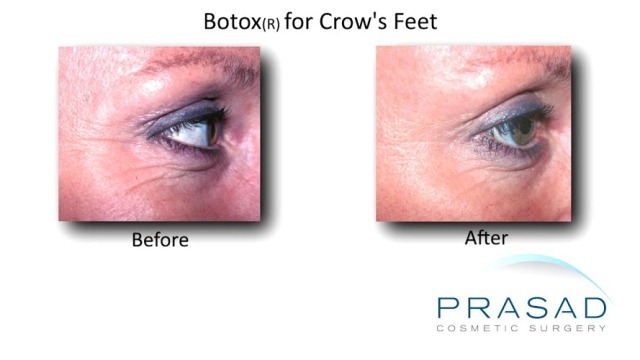 The wondrous effect of Botox generally lasts for about six months. However, for some, such as beginners to this procedure, they may need to go for another treatment after two months. The reasons for these differences in effect may be attributed to a patient’s lifestyle, their individual anatomy, and how well they absorb the substance. professions that require extreme emotional release like acting. As the muscles eventually move on from the “acquaintance stage” of Botox® to a more steady relationship, the effects will last longer. There are some recorded cases where the lines may reappear, but not exactly as it looked pre-Botox® treatment. Some are afraid that life after non-repeats of the Botox procedure will result in faces that will look even worse than before they used it, but this, fortunately, is a fallacy.